Polybead Polystyrene Blue Dyed Microsphere 0.20µm | Polysciences, Inc.
Our dyed Polybeads® are packaged in an economical 2.5% aqueous suspension and are available in a variety of sizes and colors. 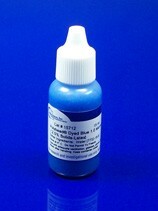 These blue dyed microspheres may be coated using adsorption, as described in Technical Data Sheet 238E. They also have amine groups that may be used for covalent coupling procedures using glutaraldehyde. See Technical Data Sheet 238D.